오늘은 크리스 신부님과 제니와 함께 장어구이를 먹으러 갑니다. 1년 전 영국의 전통음식 장어젤리의 충격에서 채 벗어나지 못하신 크리스 신부님은 겁부터 내셨는데요... 한국의 장어구이는 어떻게 생각하셨을지 영상 끝까지 확인해주세요! 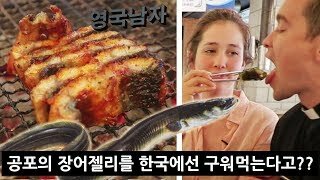 Today we take Chris and Jenny to try Korean BBQ Eel. After only ever seeing eel eaten as the traditional British "jellied eel", Chris was understandably terrified... watch to the end to see what they think! 팩 처음 해본 영국남자들!! // English Men try Korean face-mask!! 한국어 못하는 영국남자들의 한국 노래 도전!! // Learning a Korean song challenge!! 한국 아이스크림을 처음 먹어본 미국인들의 반응!? // Americans React to Korean Ice Creams!! 영국남자: 킹스맨 시크릿 에이전트 되는 법 // Becoming a Kingsman Secret Agent!! 한국 치맥을 처음 먹어본 킹스맨 배우들의 반응! ?